I have had this recipe for a while but at times its always good to add a little twist to a dish, so here is the revised version. 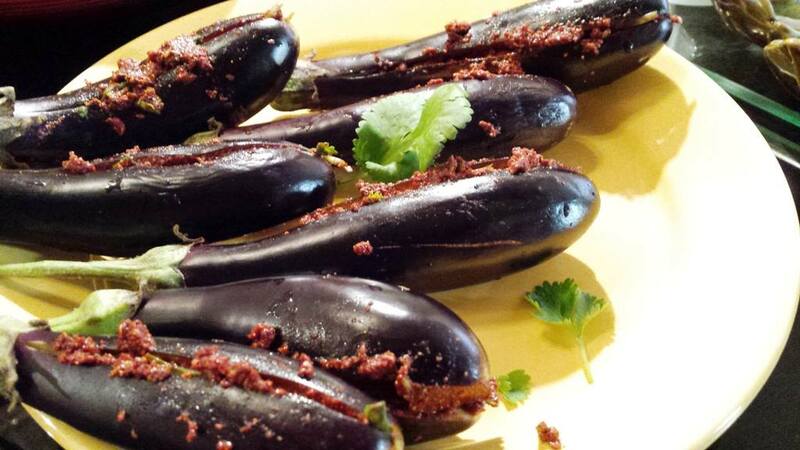 These stuffed eggplant or aubergines are a hearty dish full of flavours. I love aubergine in any kind of dishes. This one makes a statement when presented to the table, as it stand proud with great flavours that just mingle together and melts in the mouth. My very first thought of this one is tucking in with my fingers, and enjoying this with just plain boiled rice or chapatti. As much as I enjoy cooking this dish, I hope you would too. Happy cooking !! 1. Using a sharp knife slit the eggplants in the middle, a deep enough cavity for the stuff the spice mixture, taking care not to go through the skin. 2. Make the stuffing. In a bowl mix together all the ingredients for the stuffing except the sliced onion and garlic. 3. Spoon the spice mixture inside the eggplant cavity, (if you have time I advise to leave them to marinate in the fridge for at least 30 minutes). 4. Put a large, wide pan on a medium heat and add the oil. Sweat the onion and garlic over a medium heat for 15 minutes or until they have softened, stirring regularly. 5. Add the stuffed eggplants to the pan and cook on gently heat, moving them occasionally to prevent them from sticking to the pan. 7. Please handle the eggplant with care when stirring or moving them in the pan as you would like to serve them whole and in shape. Test for perfect cooking by using a sharp pointed knife inserted in the middle , if it goes through easily you know the eggplant are cooked. 8. Turn the heat off. Drizzle the ghee on top for that perfect finishing shine. Brinda’s Note: The stuffing can be varied, be bold….You can add paneer, nuts to the mixture. Experiment with your favoured spices and ingredients. Makes a delicious Vegetarian dish and the beauty of it it’s suitable for Vegans (minus the ghee) and is Gluten Free. For Non-Vegetarian option, minced meat can be added to the stuffing mixture (my advice if using mince meat would be to half cook the meat before stuffing the eggplant/aubergine).